Please note that this page is on the archived version of the website. The current version of this page can be found on the new website at: www.milkcapmania.co.uk. Milkcap Mania is the UK's premier milkcap website, including scans of every milkcap that I own. Use the Jump Menu at the top of the page to navigate the site. There are many different makes and styles of milkcaps, although I own mostly POGs, Slammer Whammers and Krome Kaps. I also own the full collection of Star Wars Tazos. If you are new to milkcaps, please see below for the story of how POGs were created and what they are. I also have a guide to playing POGs and a guide to slamming techniques. If you have any milkcaps that are missing from the site, scans of them would be greatly appreciated. Please scan them at 100% size and a resolution of 100dpi or more. Also the background on the scans should be black, if your scanner has a white inside lid then you need to scan them when it's dark and with the scanner's lid open (remember to switch the light off in the room as well). This should make them fit in with the rest of the site. If you're wondering why the background is black it's because the scanner I originally used to scan all my caps in with was black inside the lid. If it's easier to scan in a whole set than to just scan in the ones I haven't got, then please just scan the whole set. Once scanned please email your pics to me. Anything else milkcap related that you would like to see on the site, or any suggestions, please post in the forum or email me. Please see the main site for how to contact me. Added Pics of some new POG merchandise - Quickdraw POGtainer, POG Word Builder game, & POG album. POGs are back! Yes, that's right, POGs have been re-released by a company called Funrise Toys. 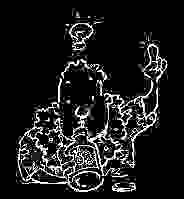 The Official website is http://www.funrise.com/pog/, or the official UK website is http://www.funrise.com/pog/uk/index.html . You may note that the 'World Pog Federation' is now the 'Global POG Federation'. In the UK only Series 1 of the new POGs have been launched. These retail for �2 per packet, twice the cost of POGs when they were launched originally. I must also say that I haven't seen them for sale in any shops, or seen any marketing for them. 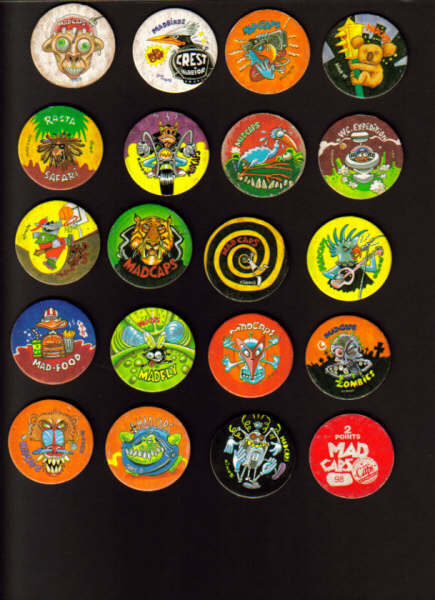 The original POGs were quite heavily marketed, being given away free with popular children's comics, cereals, and later various other foods. In the US there appears to be 3 new series available at the moment - the new Series 1, Marvel Series and NHL Series. There are also Metal Slammers available. There's also been a comedy animation produced to show alternative uses for POGs, which you can see at http://www.weebls-stuff.com/toons/pogs/. I have also moved the site to a new webhosting company, so hopefully the forums will be a lot better than on the old host. Grant Goldspink has also kindly sent me scans of some Mad Caps, POGs and other caps that I don't have. 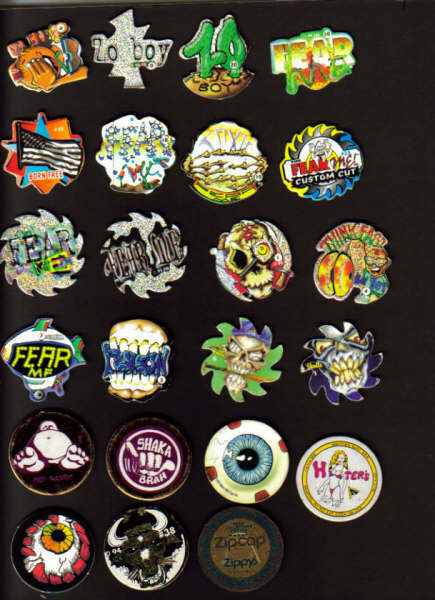 The scans were a bit small to put in with the pictures of the other caps, but you can see them by clicking the following links: Mad Caps; More Mad Caps; Various caps; American Games Caps, Random House POGs; Bad Boy Club Caps; Limited Edition POGs. Added scans of full sets of Animaniacs POGs, Cadbury POGs, Micro Tournament POGs, POG Pourri Series 2 POGs, and Series 2 (UK) POGs. Many thanks to Matt Myatt for these scans. Updated website slightly, moved the how to play section to a different page and added this News section. It all started in 1927 - the year the Haleakala Dairy in Maui, Hawaii, brought out a new brand of fruit juice. The top of each bottle had a small round cardboard lid or cap. Times were hard in Hawaii - despite the warm sunshine, fabulous beaches and all the coconuts you could eat The 1930s were the years of the Great Depression. Thousands of people lost their jobs and they had no money to spend on new toys. Children had to make their own games. And that's when the caps off the juice drinks caught someone's eye. Soon a game sprang up, invented entirely by children. The idea was to flip the bottle caps. These became known as POGs because the ingredients of the drink were Passion fruit, Orange and Guava. The craze lasted a number of years but eventually faded away. It would probably have dissapeared forever if it hadn't been for a school teacher, Blossom Galbiso. She had played POGs with all her friends when she was growing up in the 1930s. In 1991 she decided to teach the game to the pupils in her class. They loved it and told the others in the school, who told all their friends in other schools. Once again the whole of Hawaii was going mad for POGs. The game was bigger than ever before. 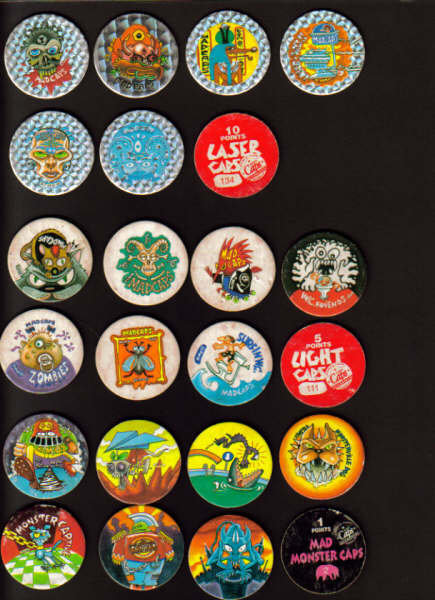 In fact, by 1992 it was reckoned that the average child in Hawaii had a collection of 1,700 POGs. 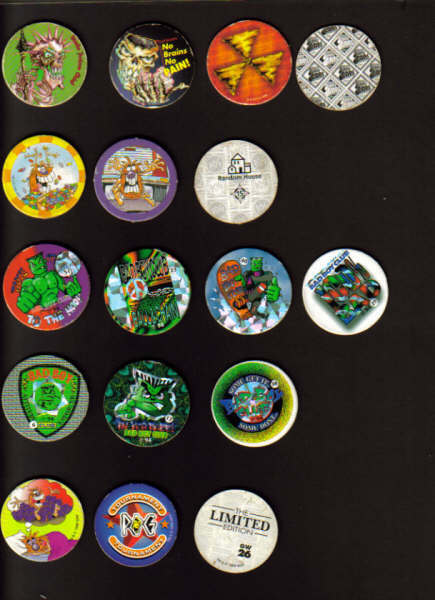 In 1993 POGs flipped over to mainland America. First California, then one by one all the other states caught on to the craze. National tournaments were organised and other makes of caps were invented to cope with the demand. POGs were launched in the UK at the beginning of 1995, and over 30 million caps have been sold here since. After about 1996 the cap craze started to die, which is a shame as it is such a great game. Maybe in another 70 years the game will be revived and start a massive craze again. Who knows?